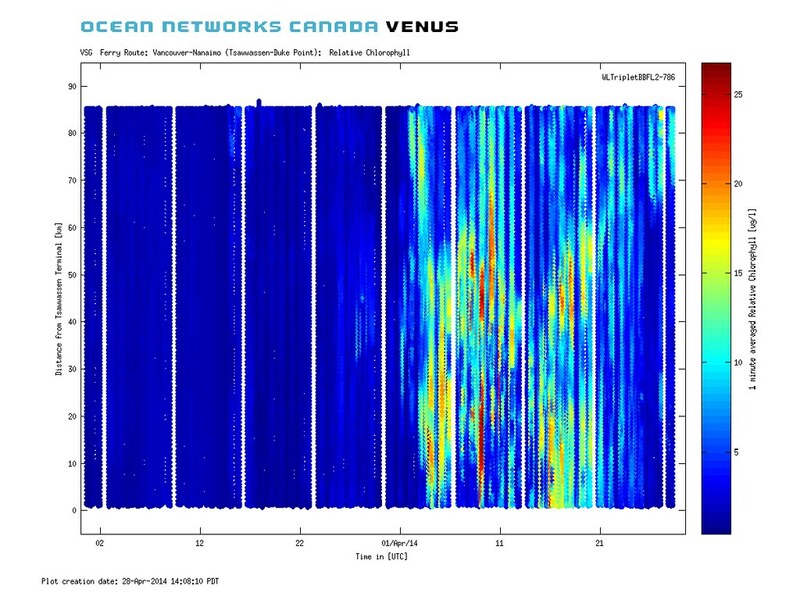 Phytoplankton biomass (mg L-1 chlorophyll a) from March 1 – April 27, 2014, in surface waters in the Strait of Georgia measured along the BC Ferries, Queen of Alberni, route between Duke Point and Tsawwassen terminal. High-resolution measurements of oceanographic conditions in the Strait of Georgia are necessary to the continued development and testing of useful predictive models. The Queen of Alberni ferry is currently instrumented for high-resolution measurements of sea-surface and meteorological properties along its route between Nanaimo and Vancouver. 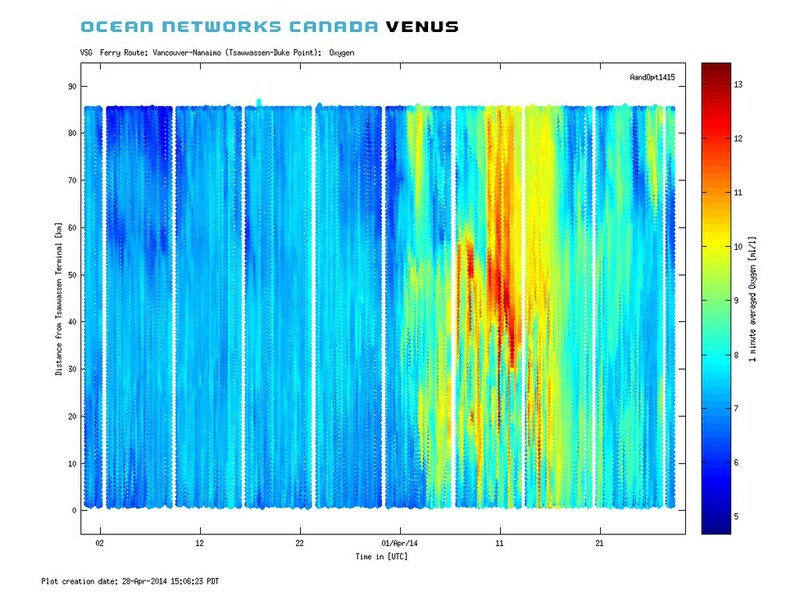 The figures presented here illustrate spatio-temporal variation in both phytoplankton biomass (lg L-1 chlorophyll a) and oxygen during a recent ~60 day period (March 1 – April 27, 2014). Both measurements are in good agreement and capture the transition from pre- to bloom conditions with this year's spring phytoplankton bloom starting April 1-2, 2014. Oxygen concentration (ml L-1) from March 1 – April 27, 2014, in surface waters in the Strait of Georgia measured along the BC Ferries, Queen of Alberni, route between Duke Point and Tsawwassen terminal. Thanks to Jim Gower (Institute of Ocean Sciences) and Chuning Wang (University of British Columbia) for ongoing and helpful discussion on the Queen of Alberni ferry track measurements.